I live in North Georgia, USA near some of the best roads in the eastern United States. I bought a 2018 phantom black 765 RS three weeks ago from Pandora's Motorsports in Chattanooga. Now have approx 850 miles on her. First service done at Pandora's two weeks later, on the same day my wife took delivery of her matte aluminum silver 765 R LRH. I traded my 1st gen Ducati Diavel Cromo for the RS. Fell in love on the test ride. 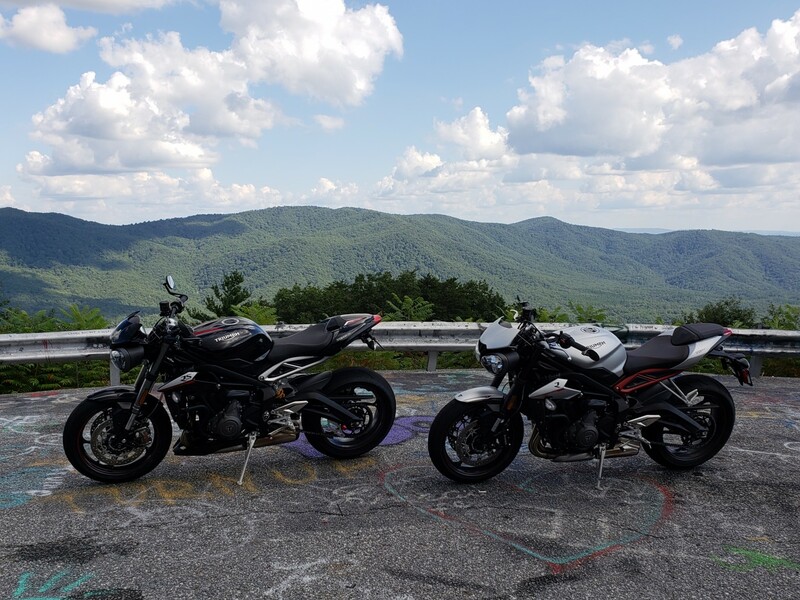 Wife traded her Yamaha FZ-07 for her 765 R, to make us a two StRriple family. I was just in Alpharetta recently. Georgia looks like a lovely part of the US. Hope that Florence stays away from you. Welcome to the site Five0five. Are you battening down the hatches over there? Well done for getting Mrs Five0five on to an ST.
Why not post some pictures of the twins when you get a chance. Stay safe and enjoy the ride. Hmmmm... only a couple of hours from TotD and Deal's Gap? Nice day out for you both. Hope the weather's good for you and that you 're not getting battered by those storms. Thank you for the warm welcome and best wishes. Fortunately for us here in north GA, from where Florence came ashore, to get near us she would have to cross the Appalachian Mountain range. We have been told to expect up to 2 inches of rain...nothing compared to what the Carolinas are suffering. Today was a typical late summer day, 92F, hot and humid. We are about 90 minutes from the Tail. We are fortunate to live within a day's ride of some excellent riding roads. I'll try to upload a photo of our two triples together from last Sunday. The weatherman from Georgia exaggerating the weather conditions a little. Welcome from me too. Pretty cool to be getting his 'n' hers 765s! Glad you're not going to be too badly affected by the storm. I know a guy from my karate club who rides trails, he recently went back to the Philippines, I'm kind of keeping my fingers crossed he's ok. Thanks for the picture, the bikes look great. How did you get Mrs Five0five on a bike or was she already riding when you met? My good lady keeps telling me she's going to get her bike licence so we can go out together! ........but I'm still waiting after 20 years.